Info: Created on 17th March 2009 . Last edited on 24th June 2009. Very nice. I love the k, but I'm not sure about the 9. Do you think I should make the tail more like the 7, I mean like a slant bar? or just make the head as wide as the total width and keep the tail design? I was thinking make the the top as wide as the total width. Like Helvetica of the space age. @aphoria I was not really convinced by my 9 either: I wanted to maintain the same head as the 8 just to keep consistency with head proportions, but sometimes you have to break your own rules and let the glyph shine on its own, right? Thank you so much for your feedback. Now it looks very nice. BTW Kudos to Rob for fixing the downloading dingy. The new 9 is much better. The sample is very nice too. Good job. 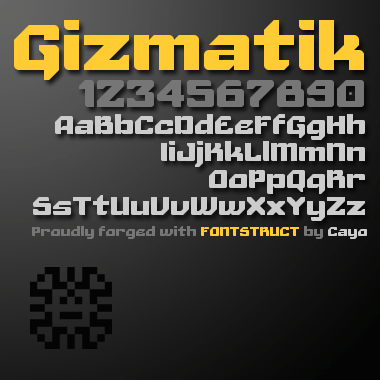 hey this font is awesome! you got talent! My first fonstruction that gets more than a 100 downloads! Thx to everybody for your kind comments. I'm definitely going to expand this one soon.